Register Log In GliderCENTRAL Forums HELP! I'M NEW... New Daddy Day 2. Nothing but sleeping and I'm freaking out! I had my sugar gliders for 2 days now. The first night they were dropped off at 8pm and then they slept till 11pm and stayed up until about 9am. Today they have been sleeping ever since and it's going on 3am here. One of them came out briefly for a few minutes ate a bit and then went back in the pouch. I know I'm probably freaking out for no reason, but I just wanted to be sure and wanted peoples experiences with this subject. Any help is appreciated and thanks again! Update: they ate for 2 minutes and went back in the pouch again! Wow sleep sleep sleep. is that normal? Last edited by drum; 05/06/17 04:25 AM. Sometimes mine wake up, go potty, grab a veggie or drink and go back to bed. It's like raiding the refrigerator in the middle of the night for us, sometimes they just aren't ready to get up at their normal time. Mine will do this for days. Then all the sudden they are out early and waiting on me to serve their dinner. They need us to be on routine, but their's is apt to change. Last edited by Ladymagyver; 05/06/17 06:35 AM. I forgot to add they will stay in their sleeping pouch and groom, sleep/ nap 18- 22 hours a day sometimes. Other times it seems they are up all night. I totally agree with Dawn. Gliders will regulate themselves on a routine/schedule, but occasionally change it up. Also, I've noticed seasonal changes in my gliders routine/schedule, possibly due to daylight hour changes. It also occurs to me that your joeys are still quite young. I had all my gliders as adults, so joeys may need extra sleep time. Just another thought. And they're still new, so that could be a contributing factor. Last edited by Terry; 05/06/17 11:44 AM. Are your gliders joeys? If so it will take them a little longer to get into a routine. I see that you are in Wisconsin, I know this is short notice but next Saturday, May 13 from 10am until ???? I am hosting a toy making party at the Fire House in Oregon, Wisconsin. 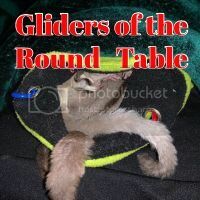 It would be a great place for you to come and chat with other glider owners and we can show you how to trim their nails. Gliders are welcome to come too. I was in the same situation when my babies first came home!! The first few nights there was very little exploring, just adjusting to the new home. I wouldn't be worried at all. The only way I knew anything was happening was food and water were gone, but otherwise you could have sworn the cage was empty! Now 2 months in, they run all over and sometimes even come to the cage doors to say hi! Give them some time, it's a new place and they are babies. Even now, some nights they go right into their pouches after eating a few bites and I don't hear them at all. Then other nights I hear them yelling at each other for taking too much space on the wheel. Let us know how it goes and post pics!! Thanks so much for the info. right now they don't eat much so I only feed them once a day, but have their diet food and a few small pieces of fruits to munch on as well. Hello Feather nice to meet you! Yes they are 8 week old Joeys. That's very awesome you are hosting a toy making party. I see that it's pretty close to madison. I live about 2 hours away from you, and don't drive and in a wheelchair, but I will let my friends know about this as well (they breed and own gliders) and maybe we can take a road trip there. I'll def let you know and thanks a bunch for the offer! Last edited by drum; 05/08/17 03:57 AM. Gliders only eat their staple plus fruits/veggies once a day regardless of their age. You will just add more as they get older. many gliders do not wake once they are down for their normal sleep. We would love to have you come, the fire station is Handicap Accessible. I do have toy making parties throughout the year, this will be the last one until after the SGGA. How did the toy making party go? I really tried to go but couldn't get a ride. It was good, we stayed until 4. Drum there will be other gatherings, probably will have one in October, for Halloween.